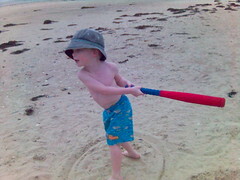 Charlie playing baseball on the beach in Normandy last week. Personally, I think he has Paul Konerko’s swing down already. You can put it on the board … Yesssss!